22 cm 512 p. : ill.
With a new foreword by Tim Cornell`Can anyone be so indifferent or idle as not to care to know by what means and under what kind of polity almost the whole inhabited world was conquered and bought under the dominion of a single city of Rome?' - Polybius, Greek HistorianThe city of Rome created the foundations of an empire that would come to challenge and conquer the great civilizations of Europe and the Near East. H.H. Scullard's definitive and highly acclaimed study reveals the peculiar genius of the Roman people, their predilection for law and order and their powers of organization and administration, all of which created a confederation the like of which the Greek World had never seen. He explores the political, military, economic and social history of this incredible empire, showing how the Romans realized an ecumenical ideal and embraced Western Civilization within one political system. Celebrated for its political and military victories as well as its incredible feats of engineering, literature and art. Scullard charts the foundation of Rome, the establishment of the Republic, and its spectacular rise until the fall of Carthage. 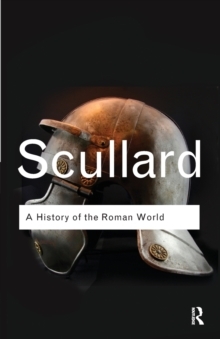 Scullard not only explores the accomplishments of the empire but vividly delves into the corruptive foreign influences which began to undermine the moral qualities of Rome, when lust for power superseded the desire for law and order.